Plan to marinate the cubed meat at least 4 hours in advance. Overnight should work as well. Use a good cut of meat. Cut the beef into approximately 1 inch cubes and trim off excess fat. Put the meat into a quart-sized sealable plastic bag. Prepare marinade in a bowl: Add brown sugar, soy sauce, garlic, sesame oil, and ground ginger. Stir the marinade ingredients together in the bowl and then pour it into the plastic bag with the beef. Coat meat with the marinade, squeeze out excess air, and seal the bag. Marinate in the refrigerator, flipping the bag a few times while the meat marinates. Shortly before grilling, prep the remaining ingredients. Cut pepper and pineapple into rectangular pieces. Thread beef, pineapple, beef, pepper, beef, tomato, beef, pineapple, beef, pepper, beef, etc. onto bamboo skewers alternating beef and other ingredients. Preheat an outdoor grill for med-high heat, and lightly oil the grate. 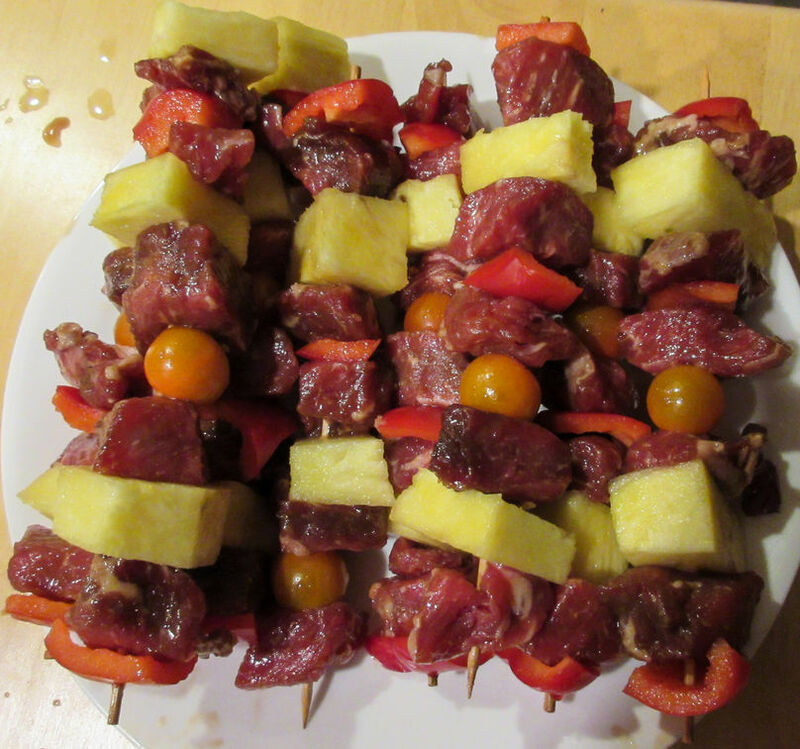 Cook the skewers on the preheated grill, turning frequently until nicely browned on all sides. Approximately 10-12 minutes should be enough for medium. Cook longer if more well done meat is desired.